My Full Trip across the southwest, in a 1969 SAAB wagon. Part 1. 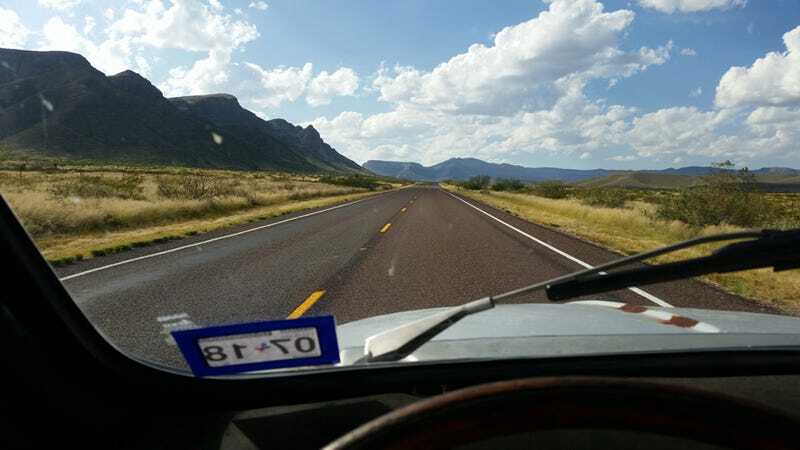 Driving north from Van Horn, Texas. I left Austin around 7AM-ish. Car packed and read to go, fresh oil, full tank, etc. Weather was pleasantly cool and foggy. Headed west on 290 towards I-10. The road is fairly hilly and you pass through some nice small towns on the way. The fog burned off about an hour later. I-10 was mostly an uneventful, boring slog. I did not go out of my way to see Marfa or any of the cool west Texas towns that are just a bit out of the way. When I got to Van Horn, I filled my tank and headed up highway 54 (top photo). Which is a pretty fun drive through nowhere - with a completely insanely too fast speed limit, given the number of blind crests, corners, and washouts along this road. Quite a bit of silt had been cleared from the pavement just prior to my driving through, evidenced by the equipment still parked along sections of the road. I can’t imagine flying over a hill at 70mph, only to see the other side is covered in several inches of very soft, fine sand. My plan was to get to Guadalupe Mountain National Park, and camp for the night. Except that didn’t pan out. See, in Van Horn, I completely forgot that the cash in my wallet was for the campsite - and I spent it on gas. I could’ve probably just parked in the camp site parking lot and slept in the car, but I decided to move on instead. Picnic area right outside of the national park. So I got back on highway 62 and headed towards El Paso. The car was having some difficulty with the elevation, and continued to hiccup and hesitate and starve for fuel at 60mph so I slowed down a bit. It’s not too long before you’re out of the mountains and out on the plains again. Once in El Paso I stopped at an autoparts store and picked up fuel filter and a spare electric fuel pump just in case. I arrived in New Mexico about 10PM, parked at the visitor’s center/rest stop, folded the rear seats in the SAAB down, got into my sleeping bag and fell asleep. Woke up at first light (no shade in an old SAAB unfortunately) and got back out on the road. New Mexico was a breeze. Getting back on the interstate after refueling, I noticed a small, old car in the traffic behind me. I couldn’t figure out what it was - but it wasn’t moving fast, even by my standards. So I slowed down. Cars passed me. But the little old car behind me wasn’t getting any closer. So I slowed down some more. More cars and trucks passed me. It was slowly getting closer. There was a break in traffic, so I thought I’d move into the fast lane and coast back until I could get alongside whatever it was that was moving along ever so slowly. Of course as soon as I did this, a trucker pulled out from the slow lane and starts passing everybody, so I had to speed up and get back in the slow lane again. By this time though, the mystery vintage car was getting pretty close - so I decided to pull off for the rest stop and hoped they’d follow me. Sure enough, seconds after I parked, they pulled up in about the last car I ever would have thought to see driving through the New Mexico desert. It was a 1962 Borgward Isabella Coupe. Of all things! It was not the first time I had seen a Borgward, but it was the first time I had seen somebody driving one, and it was the first (and probably the last) time I had seen a coupe. They were on their way to the international Borgward meet, which was taking place in California for 2017. I arrived in Tucson around noon. Rather too early to hang out with my friend in town. But I did want to take a look at the trolley museum there. I went to the address on their website - and found a whole lot of nothing. There was a small fenced in area with two streetcars enclosed in it, but no museum - and nobody about. A few minutes of investigation revealed another address a few miles away - where the bulk of the collection was stored. It’s not really a trolley museum, so much as a public transport museum. The majority of the rolling stock is old buses in various conditions. Original, restored, in progress restorations... it’s free to visit, and I was the only one there.